A spaceship crashes on an alien planet that just happens to have dinosaurs on it. As the crew bickers and walks around aimlessly, a power struggle erupts between the wienery Captain Lee Norsythe (Louie Lawless) and Jim (James Whitworth) the ship’s engineer/beard enthusiast. When the crew isn’t dropping food and weapons in a blind panic, they are getting murdered by dinosaurs. The dwindling survivors quickly realize they are going to have kill a Tyrannosaurus that has been after them or they will never survive long enough for a rescue ship to find them… if one ever does arrive. The biggest (and possibly only) strength of Planet of the Dinosaurs are the monsters. They are rendered entirely in stop motion and are very successfully matted into the action. The animation isn't perfect but its good enough to give the creatures a certain spark of personality. The highlight moment is a character getting gored and tossed of a cliff by an angry Centrosaurus. There are of course a few moments don’t work quite as well, such as a Polacanthus hunt that has an actor weaving and dodging attacks that don’t seem to be coming from the creature at all. The dinosaur footage is so good it is often taken used in other productions, most of them much worse like Galaxy of the Dinosaurs (2003). Aside from some dino-action there’s really nothing else here. The movie is padded out with long scenes of walking followed by scenes of sitting around. The costuming and hairstyles are the Platonic ideal of dated 1970’s SF, complete with big bushy mustaches, and plenty of polyester jumpsuits zipped half-way down to display hairy chests. The ship’s crew is woefully incompetent; they are constantly losing personnel and equipment by accident. There is an attempt to spice things up with some group politics and romance, but none of it is very interesting. The pacing is slow, the time between dinosaur attacks seem to stretch on forever as we watch these dopes climb a mountain or build a fence. The soundtrack is mixture of beeping electronic tones, reminiscent of the score to Forbidden Planet (1956). As film music goes, it is definitely a mixed bag, occasionally it enhances the story with an alien atmosphere and then just as often breaks into a goofy upbeat number that seems terribly out of place for what’s happening on the screen. 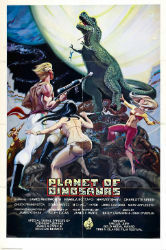 Planet of the Dinosaurs is one of those films that if you saw as a kid, you easily looked past all of its flaws to revel in the spectacle of dinosaurs eating astronauts. Many people who watched it when they were young still remember it fondly today, and that alone is an achievement for a film that was created with such limited means. Unfortunately, coming into it as an adult, even one who likes b-movies and all their problems, it can be a tough slog to get through the dull parts of this movie in order to enjoy the moments where it does shine. I suppose it all depends on how much you like dinosaurs or hate astronauts. I first watched this on Betamax way, way, WAY back in the day... it was one of the first movies, my best friend at the time and I, ever rented and watched. Back then we thought it was cool as hell, what with "spacemen" and dinosaurs, we were happy campers. We're still best friends to this day and about a year and a half ago, we managed to sit down together and watch this again. It is by no means a good movie, but we still had a good time with it.